U10 – Titans – 3 Sat, 3 Sun. U10 – Yankton Fury Gazelles – 2 or 3 both days. U12 – Titans – 3 Sat, 3 Sun. U12 – TSC Wildfire – 3 Sat, 2 Sun. U12 – SD Premier 06 – 3 games both days. 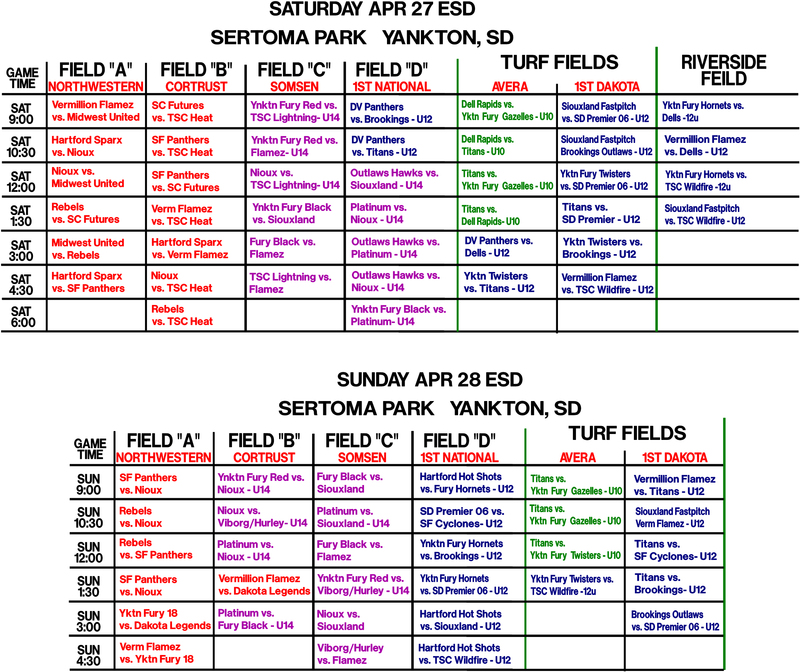 U12 – Siouxland Fastpitch – 3 Sat, 2 Sun. U12 – Brookings Outlaws – 3 games both days. U12 – Sioux Falls Cyclones 07 – 2 Sun. U12 – Dakota Valley Panthers – 3 Sat. U14 – Outlaws 14 Hawks – 3 Sat. U14 – Platinum – 3 Sat, 2 Sun. 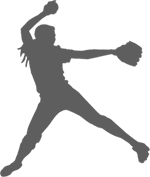 U14 – Siouxland Fastpitch – 2 Sat, 3 Sun. U14 – Yankton Fury Red – 2 Sat, 2 Sun. U14 – TSC Lightning – 5 Sat. U16 – Midwest United – 3 Sat. U16 – TSC Heat – 5 Sat. U16 – Hartford Sparx – 3 Sat. U16 – Sioux Falls Panthers – 3 Sat., 3 Sun. U18 – Vermillion Flamez – 3 Sat, 2 Sun. U18 – Yankton Fury 18’s – 2 Sun. be required to play an older/or younger team to get all games in. Please send in your fees with your registration. The host will be responsible at these weekends to pay the umpires. ASA requires 5 league games for each girl who participates in the SD ASA State tournament. Keep your own scorebook for your records. They could be requested at the State Tournament. Any team participating in these games will be considered to be in the ESD Travel League. If your team can not make any of these games but would still like to be part of the league let us know and we will add you to the list so you can schedule games against other league teams and fulfill your SD ASA requirements. This is not a tournament, these are considered league games. ASA rules will be followed. Exception we will allow you to bat everyone and allow open substitution. 10U – 5 runs per inning, 12U – 7 runs per inning. 75 min game time or 7 innings. Games can end in tie and in 10 & 12u Div if home team is behind by more than run limit when time runs out game will be over. Since these are league games and the ideal is to get girls game time the run ahead rule will be left up to the coaches at the time whether to continue or end the game.